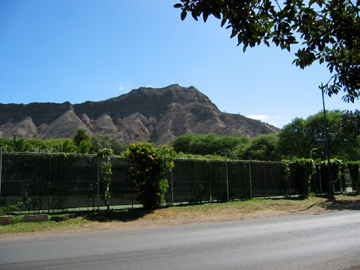 At the bottom of the hill I take this photo of Diamond Head. Note all the dead-appearing trees. This is the dry, leeward side of the mountain. I also check my map to plot out my route. When I look down at the map I notice that my front tire is flat! I've run over about a dozen really sharp thorns. I walk the two miles back to the bike rental place and decide that bicycling isn't in the cards for today. Later in the week I take a walk along the street I would have rode. I find all sorts of interesting restaurants that I would have preferred to the pricey tourist places in Waikiki if I had only known about them earlier. Sigh.